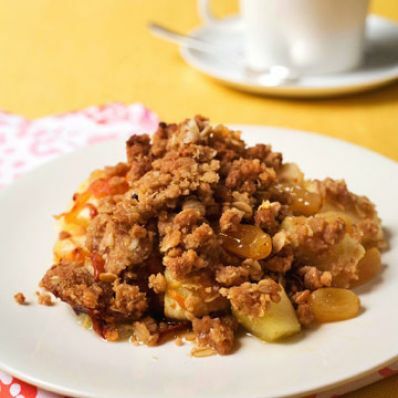 An oatmeal crumble flavored with pumpkin pie spice makes a grand topping for apples, cheddar cheese, and raisins in this sweet, chewy and crunchy dessert recipe. 1 of 4 Heat oven to 375 degree F. Coat a 13 x 9 x 2-inch baking dish with nonstick cooking spray. 2 of 4 In a large bowl, fold together apples, lemon juice, cheddar cheese and raisins. Spoon into prepared baking dish. 3 of 4 In another bowl, combine sugar, flour, oats, butter and pumpkin pie spice; mix until crumbly. Scatter over apple mixture. 4 of 4 Bake at 375 degree F for 30 minutes or until nicely browned and apples are tender. Cool at least 15 minutes. Serve warm. Per Serving: 2 g fiber, 190 mg sodium, 326 kcal cal., 9 g sat. fat, 9 g pro., 42 g carb., 15 g Fat, total, 46 mg chol.